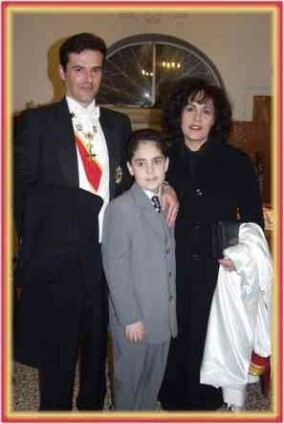 Duke of Gerona (born 1992) and Don Domenico, Duke of Ayerbe (born 2001) by his wife Noble Donna Giuseppina Campisi . HRH don Francesco is, as decided by an international Court, Royal Highness and Royal Prince of the Royal House of Aragon, Majorca and Sicily; Sovereign and Head of Name and Arms of the Royal House of Aragon, Majorca and Sicily; Nobleman of the Dukes of Carcaci, Prince of Emmanuel, Duke of Perpignan and by the Grace of God and hereditary right, as legitimate Pretender to the Thrones of Aragon, Majorca and Sicily, Prince of Catalonia, Count of Cerdagne, Count of Roussillon, Patrician of Catania, Lord of Valencia, Lord of Montpelier, Count of Urgell, Viscount of Carlades, etc, etc, Sovereign Grand Master of the Military Order of Saint Agatha of Paternò, Grand Master of the Royal Balearic Crown, Grand Master of the Royal Order of James I of Aragon, Grand Master of the Order of San Salvador of Aragon and of the Royal Aragonese Order of the Knights of Saint George and the Double Crown. He has the sovereign prerogatives known as jus majestatis and jus honorum, with the ability to confer honorific titles and chivalric distinctions relating to the hereditary dynastic Orders, and the quality of a subject of international law and of Grand Master of non-National Orders within the terms of the Law of the 3rd March 1951, No. 178.